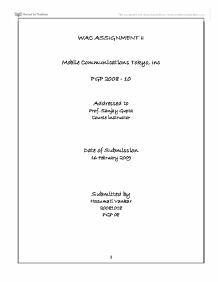 WAC ASSIGNMENT II Mobile Communications Tokyo, Inc PGP 2008 - 10 Addressed to Prof. Sanjay Gupta Course instructor Date of Submission 16 February 2009 Submitted by Hasumati Vankar 20081018 PGP 08 DECISION REPORT ON Business MCT should focus on SUBMITTED TO Mr. Hatushiro Inoue President Mobile Communications Tokyo, Inc. SUBMITTED BY Ms. Hasumati Vankar Executive Assistant June 1998 1) Decision Summary Our company has showed a tremendous growth compared to last year. We are growing fast and organizing ourselves is the need of the hour. Report discusses about a structured layout for organization and the future hiring process. As well as, it takes care of the product line we need to concentrate on that is paging and cellular telephones. Internet market is emerging and we need to capture that too using our core competency. To fulfill all these needs funding through an IPO is a best option. The funds demand can be met by listing MCT on OCT exchange this year is the best option. Word Count: 104 I Purpose As a consequence of changing telecommunication market, the purpose of this report is to outline the organization internally and decide on the businesses MCT should focus. ...read more. We should include those members having share ownership till 2% and the Vice presidents on the four departments. This would give more recognition to the Vice president's of each department. Refer Exhibit 2 3) Sources of funds: The financial statements reflect that our per share value have been consistent till 1997 (Refer Exhibit 3). Due to Asian crisis per share value had gone down in 1997 but again we have regained in 1998. We have a good growth but the sources of funds are a problem. Going through all the requirement of listing at this point MCT fulfills the criteria on listing only in OTC in Tokyo.We don't fulfill the TSE criteria as a earning of Yen100, 100 & 400 respectively is required in latest three year.We also cant fulfill the criteria to get listed in NASDAQ National market as our net worth in 1998 was less then $6MM. It was approximately $1MM. We fulfill all the criteria to get listed in NASDAQ small capital market. Now we have choice between OTC and NASDAQ. I recommend to get listed in OTC currently and then upgrade to TSE, as entry to TSE is possible and is easy through OTC. ...read more. 2) Technology implementation: As we aim to be an internet service provider we ourselves need to have the technology implemented with us. Proper IT support is needed which will further reduce our lead time. At present also our lead time is better than others competitors i.e. (NEC, Matsushita, Fijitsu, Hitachi and Mitsubishi) . We can further improve it so that it becomes impossible for the competitors to achieve such and lead time. By doing that we create differentiation in the market of cellular and paging market. We shall optimize profits, through productivity improvements, automation, economies of scale, control of wasteful expenditure and the effective combination of resources. All this is possible with a proper IT support. Words: 938 EXHIBIT 1 Exhibit 2: Board of directors Mr. Inoue (President) 56% Mr. Taiyo Kogyo(Vice President) 23% MVC Corp 4% Nissei Capital 4% Nihon Saiken Bank Capital 2% Vice President for other 3 departments 2% (this share is yet to be given) Exhibit 3 : Per share Value in ('000 US$) 1990 1991 1992 1993 1994 1995 1996 1997 1998 no. of shares 200 800 1000 1000 1000 1200 2200 3800 5000 paid in capital 80 320 400 400 400 480 880 920 1440 Per share Value 0.4 0.4 0.4 0.4 0.4 0.4 0.4 0.242105 0.288 ?? ?? ?? ?? 1 ...read more. This involves producing backups of information stored on the servers Tesco will create a backup every hour, while others will do so less frequently. This means that if the 'live' information is destroyed or damaged, a copy is available so Tesco can continue with as little disruption as possible. USA Embassy (internet link www.usembassy.org.uk) To find this website I put on Google search USA embassy + London. USA has introduced the Visa Waiver Program which applies (basically) to all European citizens. If someone is going to the USA and staying for less than 90 days it is necessary to register under this program; this was introduced for security reasons. M - Measurable - the business can put a value to the objective, e.g. �10,000 in sales in the next half year of trading. A - Agreed by all those concerned in trying to achieve the objective. R - Realistic - the objective should be challenging, but it should also be able to be achieved by the resources available. Adding the Canadian Dental Association seal also requires products to demonstrate effectiveness against cavities or plaque/gingivitis. This means there are submission requirements of the packaging and advertising for approval and close examination. Specifically, the CDA would need clinical studies demonstrating health improvements were done before granting the seal for plaque reduction and gum reduction. As 1994 progressed, the projected deficit rose to $29bn, or 8% of GDP. Its causes could be traced to a consumer boom and ominously it was financed primarily by short term external debt mostly of a nature. A second negative factor was that the political background in Mexico during 1994 became volatile. * Preparation of planning applications. A day in the life of a supervisor This is a typical day that a supervisor like Robert Seares may encounter. I have taken into account his job description in writing this. Time Activity 9:00 - 10:00 Check emails, collect paperwork and read the day's notes.